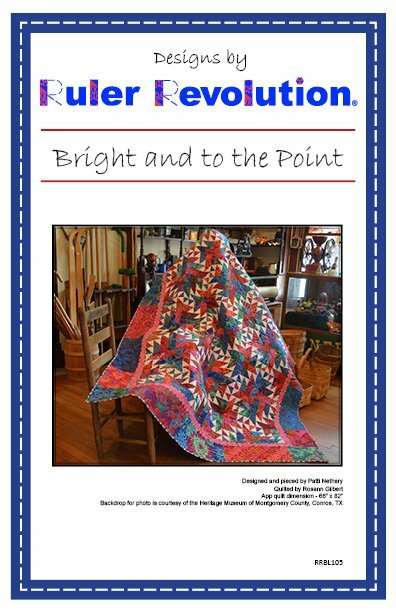 Bright and to the Point is a happy quilt to construct. The colors are bright ad cheery and the technique is fast, accurate and easy. Two different units are used in each block: Ruler Revolution's Half Square Triangles and Sticks and Stones units. The half square triangles are constructed 24 at a time and the Sticks and Stones units are constructed four at a time. This quilt looks intricate but it is only an illusion. Most importantly, there are no little bitty pieces of fabric to cut or sew! Create fewer units for a baby quilt or create more units for a bed quilt. The pattern is written for an oversize throw. Have fun piecing the Ruler Revolution Way!